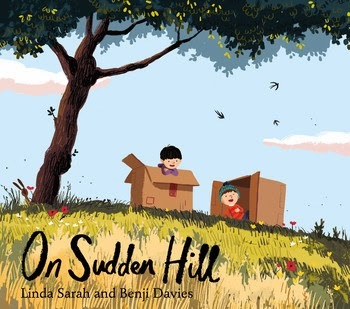 On Sudden Hill is a children’s picture book, written by Linda Sarah, illustrated by Benji Davies, and published by Simon and Schuster, 2014. A compelling story about accepting someone new, from the Benji Davies, the bestselling illustrator of The Storm Whale. I love the themes of this book! Apart from the fact that I happen to passionately believe in the value of the cardboard box as toy and creative material, I appreciate any good children’s books that deal sensitively with the themes of friendship and acceptance. It’s not a heavy-handed lesson; rather children are invited to share Birt’s dilemma and feelings, and think about ways for him to move forward. Sarah has done a great job with the story, capturing the excitement and limitless possibilities of play, and the bitter corrosion of jealousy and loneliness.